Keep soups, stews, deli salads, and desserts contained during storage, transport, and display, with this ChoiceHD 8 oz. microwavable translucent plastic deli container and lid combo pack! This combo pack includes a container and a lid, allowing you to package and store food with ease. Each container is made of heavy weight polypropylene with a translucent appearance for product visibility and quick identification of contents. At the same time, the durable design ensures that this pack is great for delis, restaurants, and grocery stores. The 8oz containers are extremely sturdy and perfect for wet items like curries and sauces. Since they are generally used in bulk it helps that the containers can be stacked even up to 6 in a stack. Its best filled only up to the line. Choice microwavable containers are high quality containers that withstand the heat in a microwave and have high durability for multiple uses as well. The are great for packing left overs with or smaller portions of food to go items. This is the perfect container to sell our whipped shea butter in! We ship most of our products, so these containers travel all around the country and have never leaked or broke. Great quality! These are great togo containers for our deli salads. We put all of our salads in these and customers have even reported using them for their own storage after consuming our salads, we even use them for measuring. we use these for our dressings and sauces. they work perfect with no leaks ever. They work really well in the freezer or in the cooler and make for a nice presentation. These containers are very convenient. They do not take up too much room & the lids secure tightly. The containers also stack nice & they do not easily tip over. I use the 8 oz. deli container/lid for yogurt, nuts, cut up fruit, veggies, pasta salad, etc. They are the perfect size and great for portion control. We use these to hold purees that we produce when seasonal fruits are at their peak. They easily handle the warm puree, freeze well, and are then sturdy enough to reheat, use, and wash for reuse. Very very sturdy. Perfect for packing homemade sweets for gifting purpose. I use it for years and never think about switching the product. Great for packing the party leftovers too. Before I forget , I use it for packing fruits for my daughter (I pack it every sunday and label it with day name) and keep it in the refrigerator. Portion control eating … donot look for anything else.. this is the product to go. This is very well made and of good quality. The lids fit nicely and tight. Clear containers are good for customers to see the contents inside. perfect size to store small quantities of product and have an organized fridge. the lid closes perfectly. you can re use them and wash them in a high temp dishwasher. Of all the choice brand products, these cups are the best. Super durable for repeated kitchen use. What the most important thing about this is the lid, it not only hugs well but also reseals easily for kitchen use. We use these for products that are really sloshy, like soups or briny pickles. We love them because they do not break and they do not leak. These containers are not only crucial to our business but they have become crucial to our home as well, they hold up through the microwave and the dishwasher. They stack beautifully and almost lock on to one another so that if you have them in a cooler or something they will not slide all over the place. 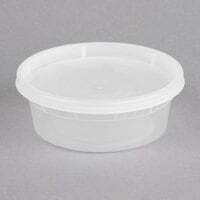 The lids fit on deli containers of all sizes which is incredibly convenient. Love these microwaveable plastic deli containers. The 8 oz are just the right size for fruit or vegetables for one. We get a lot of people asking where we got them. Using these for Slime containers and these are the perfect size for a medium size slime. They come with the lids so that is a plus! They are solid and the lids will not pop off easily. They have to be pulled off pretty forcefully. Nice and airtight. Will be suggesting these to all our friends! Not the best product but price wise the best,only thing when you stacking in Fridge or freezer take the air out than it work OK. This little container is great for garnishes or other items you don't need much of. We tend to use these for cilantro on our smaller catering orders. An excellent to go cup, and keeps the items inside at temperature. Our patrons appreciate that they are microwavable so they can reheat the food items. These are great for soups, salad, pretty much everything. The lid goes on very tight and the chance of spills is pretty much zero. The plastic is thick and you rarely get a broken one in the box like some other brands. These are great containers with locking lids. They don't leak, and they're high quality. They come with the lid which is very convenient. They may break with a lot of pressure, but rarely. This container is one of the best in my view because there is no leakage if you keep any liquid in the container, it holds up pretty strongly for it size and in my view it is kind of made up of strong plastic. The lid seals up perfectly with the container and it holds onto it pretty good. Purchased the 8oz deli containers to use for my whipped body butters, the containers are really good quality and my butters look very professional in them. You won't regret purchasing these containers. We had been buying these from our major supplier but no more after calculating product cost and shipping from we here ended up being cheaper by 25%. The product itself is top quality. A great small 8 ounce deli container with lid combo pack. The containers are made of strong plastic and are great for side orders of potato salad and baked beans. The lids go on tight for a great seal. Another great container! Works great for packing our sauces, with no leakage. Seems as if a few containers are always broken in shipping, but not enough to keep me from buying the product. Containers are perfect for freezing! It seals tight and protects food. We use our containers for dips and storing sweet treats. The clear exterior makes our product stand out. These containers are a lifesaver for our vegan cheese sauce. Microwaveable, durable, they seal tight, and they speed up our process quite a bit by being able to measure the amount of sauce in each container by filling to the top line. We use these to cool our final product and they help to keep out any moisture. The price is also fantastic. We love these guys! Dishwasher safe and reusable at home all day long. Containers are super durable, and easy to use. Great for sauces, toppings, or any other additional side you may need to add to your dish. Highly recommend. This is a wonderful product. Works great! Holds up all the items we put in it. Tight seal as well. I could not have a better container. These containers are great! I use them to freeze my homemade marinara sauce into 8 oz portions. When I am ready to use, I simply microwave the sauce in the container. These are great containers they hold leftovers perfectly. They seal up liquid tight. Microwave and freezer safe these hold up for a long time. Perfect for meal prep.